WordPress and Tumblr are two such platforms that allow you to get your blog up and running free of cost. 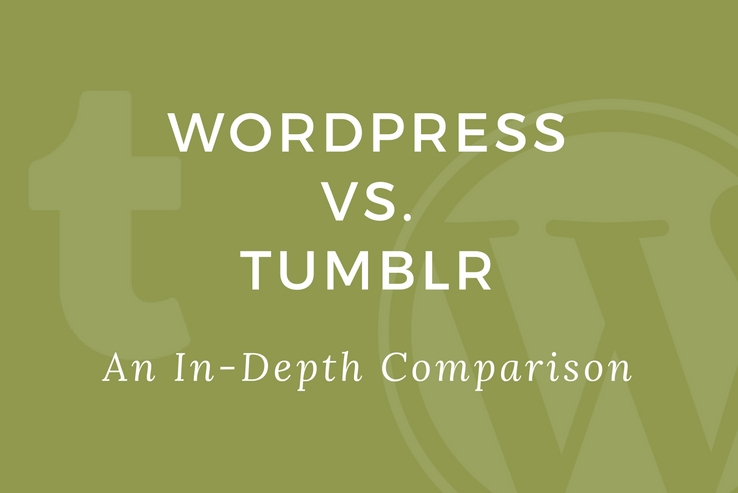 With this in mind, in this post, we’ll compare and contrast WordPress and Tumblr based on a pre-defined criteria. By the time you’re done reading this post, you’ll have a better idea about which platform is right for you. WordPress has been around for more than a decade and it has done incredibly well as a content management system (CMS) since then. Its flexibility, robustness, and rich feature set make it a popular choice for all kinds of users, regardless of their technical expertise. As of this writing, WordPress holds a market share of 58.89% and is the most popular CMS out there. Self-hosted WordPress allows users to showcase their vision and ideas and shape them into reality. Publishing platform that focuses on content creation. Users have the freedom to fully customize their blog with plenty of themes and plugins. Intuitive back-end offers many features for both website owners and developers. Millions of people use WordPress for their blogs, news sites, and online stores because of its versatility and gradual learning curve. Even big name brands like BBC America, Sony Music, and MTV News are powered by WordPress. Tumblr is a social media platform where people create content and publish it on their blog or re-blog it. Getting started with Tumblr won’t cost you a dime; however, the platform does offer premium themes that allow you to customize your blog’s appearance. Although most Tumblr users are all about art, photography, and image-intensive content, some also take to publishing blog posts. Tumblr rents out free space for users to run their blogs and offers them hosting and security for their content. Simply put, your content will be on Tumblr’s server. This means that you don’t own the data and can’t claim ownership. Offers a minimalist layout with options to change background color schemes and typography. Allows users to customize their blogs using free or premium themes. Integrates seamlessly with Google Analytics to track site traffic. Basically, Tumblr is a blogging platform that doubles as a social network. Its blogs attract traffic from all over the globe, though it is more popular among younger audiences. How Do I Evaluate WordPress and Tumblr? By now you should have an introductory understanding of both platforms and their blogging potential. So far, it’s evident that both WordPress and Tumblr are positioned for different types of website owners. While WordPress is more of a content creation platform, Tumblr is a content curation tool. Between WordPress and Tumblr, which blogging platform do you prefer? That said, at their core, both WordPress and Tumblr are ideal blogging platforms. For this reason, we’ve defined a criterion against which we’ll evaluate both options. Usability. This defines how easy it is for a new user to get started with the platform. Interface. Is the platform’s interface intuitive? Or is it complex and difficult? Customization. This criterion gives you an idea of how much control you have over your website’s design and appearance. Search Engine Optimization. Is the platform SEO friendly? A search engine optimized platform increases the chances of having your blog get ranked better on search engine result pages. Ownership. Who owns the content? And can you claim ownership over the content? The usability aspect of any blogging tool can be a major deciding factor when it comes down to choosing one over the other. And if you’re going to have a team of users accessing your blog’s back-end to upload and publish content, then it’s important that it’s intuitive and easy to use. WordPress is incredibly user-friendly and is designed for multiple users to access its back-end. The platform comes with pre-set user roles right out of the box for admins, editors, authors, contributors, and subscribers. You don’t have to be a tech guru to operate a WordPress-based website. With the WYSIWYG editor, you can start publishing blog content in minutes and without any coding knowledge. With Tumblr, all you have to do is sign up. Once you’re logged into your account, you can start publishing blog posts immediately. It’s got everything you need to create content on its main screen and is super-easy to use for everyone – regardless of their technical expertise. Similar to WordPress, Tumblr also features a WYSIWYG text editor. Ergonomic interface design is all about making it easier for users to interact with software. A well-designed interface typically follows the industry’s best practices in terms of consistency, simplicity, and cognitive directness. The WordPress admin panel gives you a quick glance at your content’s status, comments, and information about recent activity. It also features a Quick Draft section that allows you to jot down any ideas you may have for future posts before you forget them. From the admin panel, you can navigate to the Posts section to manage your blog content. In terms of blogging options, WordPress has everything you could possibly need to create well-formatted content complete with media files. And as we mentioned above, you get a WYSIWYG editor and an HTML editor, too! Tumblr, on the other hand, has everything in one place. And in terms of design, it’s far more minimal than WordPress. The main dashboard has all of the different options the platform offers displayed front and center. One of the best things about its interface is that it has a distraction-free design. You’re able to focus entirely on your content and still have the basic set of tools in place to format it and add media files. Customization allows website owners to make their blog look more inviting. If you’d rather not mess around with CSS code, you can install a theme to your blog and increase its visual appeal instantly. When it comes to WordPress, there’s no shortage of customization options. You can scour the WordPress Theme Directory for thousands of free themes for your blog. And when you want to take things to the next level, you can always opt for a premium alternative. WordPress also gives you the option to edit the theme’s files without leaving the admin panel. In addition to this, you can add widgets to your pages and install plugins to integrate advanced functionality on your blog. Unlike WordPress, Tumblr doesn’t give you a lot of customization power over your blog. That said, you can still customize the blog to some extent. For instance, its built-in customization options enable you to pick out a free theme from their repository or browse premium offerings. Additionally, you can install your own theme by adding its HTML code. Again, this option is limited to users who are programming literate. If you want your site to show up in search engine result pages and get massive amounts of traffic, there’s no escaping search engine optimization (SEO). Most content management systems (CMSs) offer some sort of SEO right out of the box. Let’s take a look at how WordPress and Tumblr measure up to this criterion. WordPress is marketed as a CMS solution and therefore, offers excellent SEO capabilities right out of the box. Its default text editor allows you to add multi-level heading tags, links, and more tags, which contribute significantly to your blog post’s SEO. WordPress also lets you add meta descriptions, meta titles, and excerpts to your blog posts without touching a single line of code. In addition to this, you get access to free SEO plugins like Yoast SEO that take all the heavy lifting out of it. Optimizing your Tumblr blog for SEO is no cakewalk. First, you’ll need to get a custom top-level domain to replace your default www.your-site.tumblr.com URL. The default .tumblr.com appended at the end of your blog’s URL doesn’t help with SEO. The good news is that you can add meta descriptions and heading tags to your blog posts. The bad news is that you have to do it all by adding HTML code into the text editor. In most cases, before you can begin using a blogging tool or CMS, you have to agree to its terms and conditions. And if you violate the agreement in any way, the platform moderators can delete your blog website or the content you’ve published on it without notifying you. This is why it’s important to know beforehand if you actually own your blog or not. Automattic owns WordPress.com and they have the ownership rights to the content you publish on it. However, WordPress.org is an open-source CMS, which means that you have complete control over your website because it’s hosted on your own server. Tumblr reserves the rights to your blog and the content you publish on it. This means that you can’t claim ownership of it. With Tumblr, you’re basically using their server space to host your content. You cannot claim ownership over your blog but you can export your blog posts’ content from Tumblr to your drive. WordPress and Tumblr: Which Platform Should I Go With? Now that we have a better idea of how WordPress and Tumblr stack up against our evaluation criteria, it’s time to answer the question: which platform should you go with? If your blog’s goal is to share posts with your social media following then Tumblr is the best fit for you. Its social media-like core functionality makes it easy to share and curate engaging content. However, if you want to create a complete blogging website then you’re better off opting for WordPress. It gives you all the right functionality you need to launch your blog, customize it, and publish all kinds of content to it. And if your blog is image-intensive then you may want to go with Tumblr. The platform is incredibly popular among users who share primarily media files through their blogs. If it’s important for you to own you blog then WordPress is the obvious choice. Self-hosted WordPress.org will set you back a few bucks but you’ll have complete control over your site. In our opinion, instead of choosing between WordPress and Tumblr, a better option is to use both of them. Think of it like this: you create your blog with WordPress and use Tumblr solely as a distribution platform. Tumblr’s social media functionality can help you get the most out of it by steering more traffic to your blog. Check out the Infographic for an quick comparison. Tumblr is a blogging-centered platform whereas WordPress is a full-blown content management system. At the end of the day, the platform you end up going with depends entirely on your blogging needs. We evaluated both WordPress and Tumblr against our criteria and offered some insight into which platform you should opt for by laying out use case scenarios. Between WordPress and Tumblr, which blogging platform are you leaning towards and why? Let us know in the comments section below!